In the modern era, warfare entered a new phase. Technological innovation yielded evermore destructive weaponry, international communications and alliances greatly extended the reach of conflicts, and military strategists increasingly targeted infrastructure and civilians, while new mediaâ€”first photography, then film and televisionâ€”conveyed the horror and brutality of industrialized combat to those who had the good fortune to live beyond the battle zones. 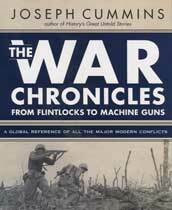 The War Chronicles: From Flintlocks to Machine Guns adopts the innovative and accessible format of its predecessor, which spanned the period from 500 BC to the American Revolution, to chart the astonishingly rapid evolution of modern warfare. In doing so, it traces the transformation of battle tactics, from the prearranged set-piece encounters of the Napoleonic Wars to the massive naval landings and aerial bombardments of World War II, explains the scientific innovations that yielded the machine gun, the tank, and the atom bomb, and vividly renders the key victories that turned the tide of war, from Waterloo to Gettysburg and D-Day. At the same time, it reiterates the constants of conflict: the slaughters and massacres, including the Holocaust and the little-known Taiping Rebellion, which killed up to forty million Chinese; the personal sacrifices made by those battling tyranny, among them the rebels of revolutionary France, Greece, and Mexico; and the extraordinary influence of charismatic leaders, ranging from Napoleon and Pancho Villa to Mao Zedong and Hitler. 431 pages, HB w/dust jacket, Illustrated, 8 x 10in.